AT&T Park, the home of the San Francisco Giants, is one of the most beautiful ballparks in all of Major League Baseball, from its location to its design and overall experience. Opened in 2000, the stadium seats 41,915 fans and is located in the South of Market (SoMa) neighborhood of San Francisco, California. 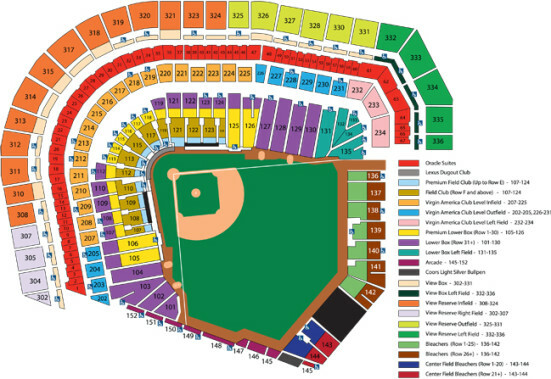 Take a look at a seating chart for the ballpark if you are in the market for tickets. In addition to the tour, other elements of note at AT&T Park are the right field wall in honor of Willie Mays that stands 24 feet high (Mays wore number 24 if you didn’t know) as well as McCovey Cove just beyond the wall. The cove is a part of San Francisco Bay where many “splash hits” have landed – home runs scaling the wall and out of the ballpark into the bay. There also four statues outside the ballpark honoring great Giants players of the past – Willie Mays, Willie McCovey, Juan Marichal and Orlando Cepeda. In addition to being the home field of the Giants, AT&T Park will also serve as the host for the semifinals and finals of the World Baseball Classic. Check out a listing of events below and find the best deals on tickets right here at SeatGeek.